Page 7 (of article) - pg. 58 of magazine, the article continues, includes two pictures of Brendan Perry from "Dead Can Dance's final performance at the Seaview Ballroom, St. Kilda, Melbourne, Australia, from April 1982. Photos courtesy of Eden's Sean Bowley." Page 8 (of article) - pg. 59 of magazine, the article continues, includes two pictures of Lisa Gerrard from the same 1982 show. Page 10 (of article) - pg. 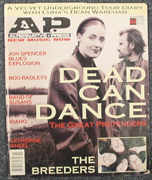 61 of magazine, the magazine then lists the Dead Can Dance discography - including the albums, plus notes the "Lonely is an Eyesore" tracks, and "Baraka"